Now announcing the first meeting of COMMA 2017-2018 Reading Group and Lecture Series, MARXISM IN REVERSE. Through the year we will read the work of major Marxist critics “in reverse”, starting with the contemporaries and working our way back to Marx. 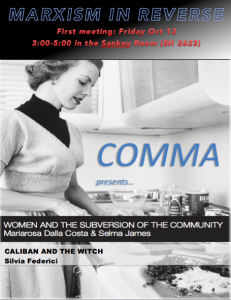 We will read Silvia Federici, Selma James. Louis Althusser, Angela Davis, Frantz Fanon, Georg Lukacs, Adorno and Horkheimer, Antonio Gramsci, Rosa Luxembourg, and Karl Marx. Our first meeting is on Friday October 13th, 3:00 in South Hall, the Sankey Room.